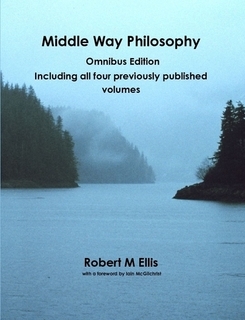 The “Middle Way” Ellis argues for so cogently is far from being a simple compromise between existing polarities, but a departure at right angles to typical thinking in the modern Western world, which looks to me like the path to ancient wisdom. The perception that objectivity is neither an absolute, nor any the less real for that, is central. Ellis argues for an approach that is incremental and continuously responsive to what is given, rather than abstract and absolute. This is the difference, as he notes, between the pragmatic, provisional, nuanced, never fixed position of the right hemisphere in the face of the absolutism towards which the left hemisphere always tends. The need for certainty must inevitably lead to illusion, whether in philosophy or in the business of living, and here too Ellis makes clear – as far as I am aware for the first time – the connections between the cognitive distortions known to psychology and the fallacies identified in the process of philosophy. This is an important, original work, that should get the widest possible hearing. Iain McGilchrist is the author of ‘The Master and his Emissary’, fellow of All Soul’s College Oxford and a former psychiatrist. This foreword was originally written for volume 1 of the series.